Gabe Kingsbury (left) and Roscoe Witham recently opened Float 207 in Hermon, a float spa offering sensory deprivation / float tank therapy. Float 207 is the first and only flotation therapy center in Greater Bangor and offers three float rooms and two infrared saunas. In an unassuming building just off Route 2 in Hermon there’s a new business that offers an experience that proponents say can ease a troubled mind and body and make you feel like you’re floating in space. 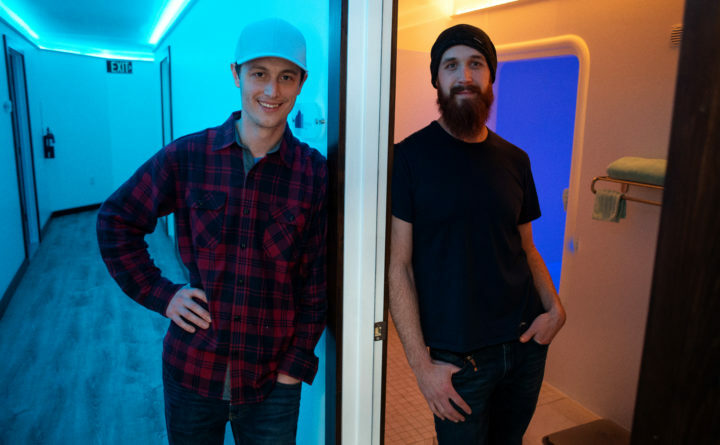 Float 207, which opened in October by childhood friends Roscoe Witham, 31, and Gabe Kingsbury, 28, both Hampden Academy graduates, offers float therapy: sensory-deprivation tanks, essentially, filled with salty, ultra-buoyant water that is heated to skin temperature. You get in, you lie down, and you try to let reality melt away for 90 minutes. At Float 207 there are three 7-foot-tall float tanks, or pods, two of which are 4 feet, 8 inches wide, and one of which is 6 feet, 11 inches wide. Each is filled with 10 inches of water that has been filtered and purified three times before each floating session, into which is dissolved more than 1,200 pounds of Epsom salt. The salt makes the water incredibly buoyant, so the body is barely submerged, giving a sense of weightlessness. Floaters can opt for total darkness and soundlessness within the pod, or they can opt for an array of colored lights, and music or other sounds of their choosing. Inside one of the three float rooms at Float 207 in Hermon. Floatation therapy is considered an alternative therapy and only a few scientific studies support its efficacy, but Kingsbury and Witham say benefits of floating include relaxing achy muscles, soothing an anxious mind, and helping people cope with conditions such as post-traumatic stress disorder, fibromyalgia and chronic pain from old injuries. Though sensory deprivation tanks were made popular in the 1960s and 1970s by the New Age movement and the psychedelic era, interest waned in the 1980s. About 10 years ago, interest in floating resurfaced, after athletes including Tom Brady and Steph Curry and actress Jennifer Lawrence publicly promoted their use of float pods, and podcaster Joe Rogan glowingly described his many experiences floating on his show. Kingsbury and Witham first encountered floatation therapy just a few years ago. Float Harder, Maine’s first float therapy center, had recently opened in Portland, and after both tried it for the first time, they were hooked. 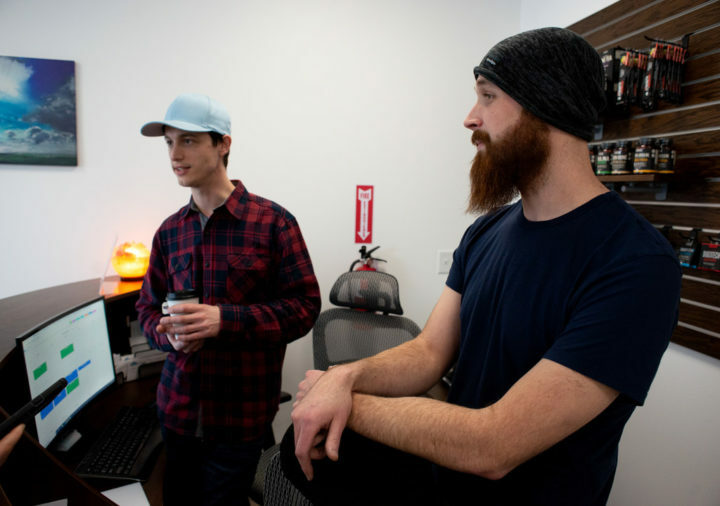 Roscoe Witham (right) and Gabe Kingsbury and recently opened Float 207 on Rt.2 in Hermon, a float spa offering sensory deprivation / float tank therapy. Float 207 is the first and only flotation therapy center in Greater Bangor and offers three float rooms and two infrared saunas. About a year ago, the pair decided that a float spa could work in the Bangor area. After doing extensive market research and looking at various locations, they landed on Hermon, at 1723 Hammond St., in a quiet, otherwise mostly industrial part of town. Float 207 and Float Harder are the only float spas in Maine. Kingsbury said that just three months in, he and Witham have welcomed customers from as far away as the Aroostook County town of St. Agatha, and Moncton, New Brunswick. 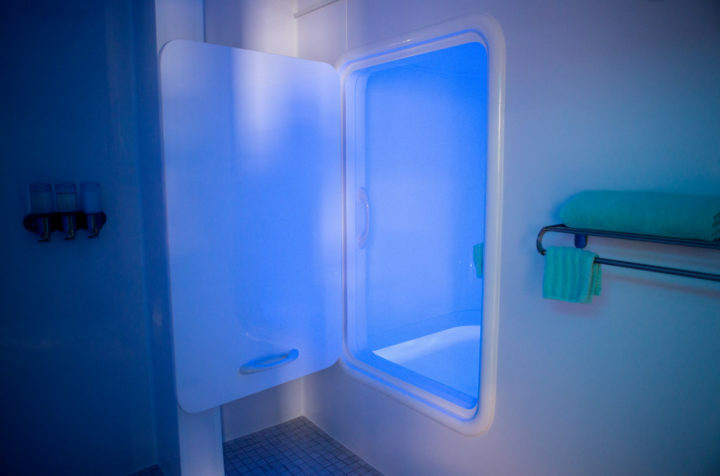 One 90-minute float session at Float 207 costs $65; the larger, “deluxe” float pod is $75 for 90 minutes. Float 207 also offers two infrared saunas, which are sauna-like wooden rooms that use infrared heaters to heat the body directly, rather than in a traditional sauna, which heats the air around the body. Kingsbury and Witham also plan to a hire a massage therapist and an acupuncturist later on in 2019. For more information, visit float207.com, or like Float 207 on Facebook.